See North Carolina’s original copy of the Bill of Rights from Wednesday through Sunday, Dec. 14 to Dec. 18, at the N.C. Museum of History in Raleigh. Image credit: State Archives of North Carolina. RALEIGH, N.C. — In honor of the Bill of Rights’ 225th anniversary on Dec. 15, you will have a rare opportunity to see North Carolina’s original copy of the Bill of Rights from Wednesday through Sunday, Dec. 14 to Dec. 18, at the N.C. Museum of History in Raleigh. Admission is free. To protect the fragile document from light, it is on view for a very limited time. In addition, the museum will offer free programs about the Bill of Rights on Dec. 14. Linda R. Monk, a nationally award-winning author, journalist and constitutional scholar, will present The Bill of Rights: How North Carolina Saved the Constitution. (Did you know North Carolina was the only state to refuse to ratify the U.S. Constitution until a bill of rights was added?) Monk’s work has been featured on PBS, Voice of America, MSNBC, C-SPAN and NPR, and she writes commentary for newspapers nationwide. After Monk’s program, State Archivist Sarah Koonts will briefly highlight the saga of North Carolina’s original copy of the Bill of Rights, from its theft by a Union soldier during the Civil War to its recovery by the FBI in 2003. Wednesday, Dec. 14, noon-1 p.m.
Register at NCMOH-programs.com and purchase a boxed lunch — or just bring your own. Beverages provided. For information, call 919-807-7982. North Carolina’s role in ratifying the U.S. Constitution helped result in James Madison sponsoring the first 10 amendments in Congress. Ratified on Dec. 15, 1791, that Bill of Rights upholds the key freedoms Americans cherish to this day. Monk uses an accessible, narrative style to explore truths about our constitutional democracy. She conveys this depth of knowledge in a manner that is relevant and understandable to average citizens. Monk also presents seminars and lectures for audiences that include the Pentagon, National Archives, Fulbright Scholars and the Smithsonian Institution. Wednesday, Dec. 14, 1 p.m.
North Carolina’s state archivist will briefly trace the intriguing history of North Carolina’s official copy of the Bill of Rights. The journey started when a Union soldier stole it from the State Capitol in 1865 and ended in 2003, when it was recovered in an undercover FBI sting operation. After legal battles in state and federal courts, North Carolina won possession of the document in 2005 and ownership in 2008. North Carolina’s copy of the Bill of Rights is one of 14 original copies of the 12 proposed amendments to the U.S. Constitution prepared by three federal clerks in 1789. A copy was drafted for the legislatures of the existing 13 states to debate; the other copy was for the federal government. After the ratification of the first 10 amendments in 1791, North Carolina retained custody of its copy of the document. NCDNCR includes 27 historic sites, seven history museums, two art museums, two science museums, three aquariums and Jennette’s Pier, 39 state parks and recreation areas, the N.C. Zoo, the nation’s first state-supported Symphony Orchestra, the State Library, the State Archives, the N.C. Arts Council, State Preservation Office and the Office of State Archaeology, along with the Division of Land and Water Stewardship. For more information, please call 919-807-7300 or visit www.ncdcr.gov. This entry was posted in Events, News and tagged Bill of Rights, events, North Carolina Museum of History, treasures on December 1, 2016 by Ashley. Did you know that the land of the Carolinas once extended ocean to ocean, covering parts of what is now Florida, Mexico, Texas, and California? King Charles II granted this land in 1663 to several of his supporters—the “Lords Proprietors”—in return for their service to the Crown during the English Restoration. The gift of land was designated in the Carolina Charter of 1663. 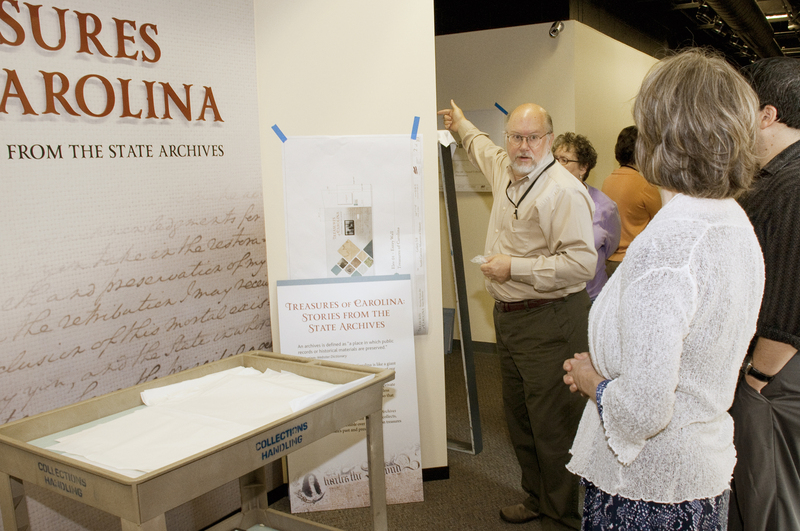 The Carolina Charter will be on view in the Treasures of Carolina: Stories from the State Archives at the Museum of History, 109 East Jones St., Raleigh. Visit and see rare documents from the State Archives’ vault and learn about the characters and stories behind them through the exhibit. Treasures of Carolina will run through June 19 and admission is free. For information about the N.C. Museum of History, a Smithsonian-affiliated museum, call 919-807-7900 or access ncmuseumofhistory.org. This entry was posted in Events, News and tagged events, North Carolina Museum of History, treasures, Treasures of Carolina on February 2, 2016 by avgabriel2. Last Saturday the exhibit “Treasures of Carolina: Stories from the State Archives” opened at the North Carolina Museum of History. What’s being said about the exhibit? The State Archives of North Carolina will also be among the institutions featured on “Collecting Carolina” on Friday, October 30, 9PM on UNC-TV EX. To see a list and summary of the “Collecting Carolina” episodes, or to view previous episodes, visit http://www.unctv.org/content/ncweekend/collecting/show. 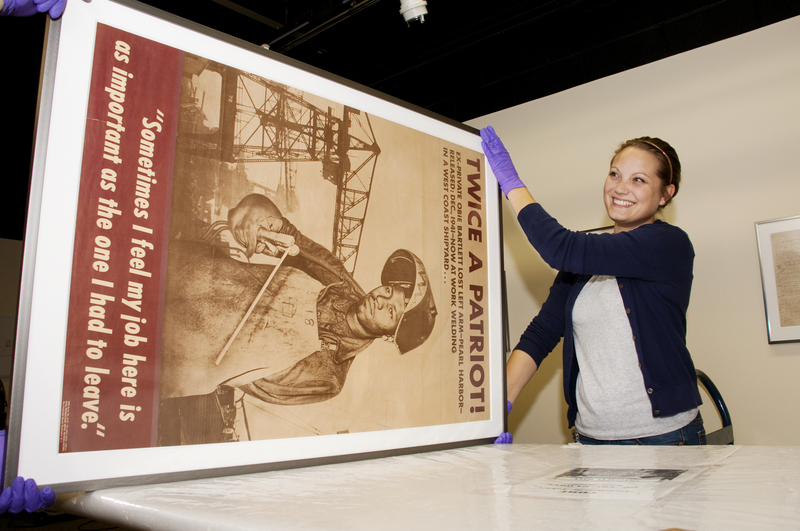 Staff from the North Carolina Museum of History moving in items for the “Treasures of Carolina” exhibit, October 2015. Are you interested in seeing how a museum exhibit is put in place? Behind-the-scenes photos of “Treasures of Carolina” being moved into the History Museum in early October are available on our Facebook and Twitter accounts. Staff from the State Archives of North Carolina and the North Carolina Museum of History moving in items for the “Treasures of Carolina” exhibit. This entry was posted in Events, News and tagged exhibits, North Carolina Museum of History, Treasures of Carolina, TV, UNC-TV on October 30, 2015 by Ashley. First page of a letter from Martha Hendley Poteet to Francis Marion Poteet, June 16, 1864. Poteet-Dickson Letters, Private Collections. 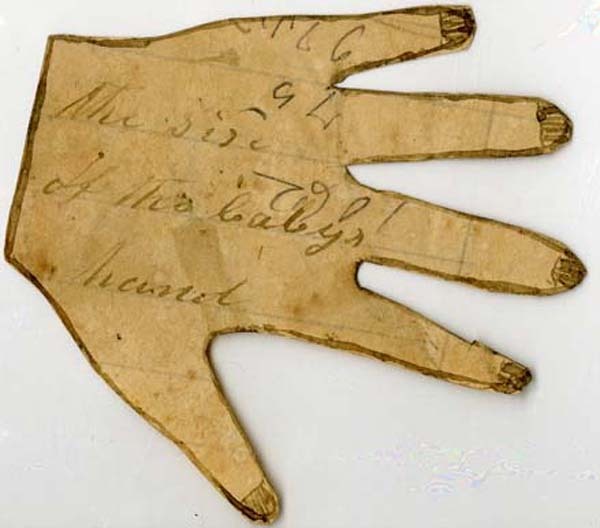 Among the items in the Private Collections are Civil War letters, journals, diaries and remembrances. A series of letters between Martha Henley Poteet and her husband, Francis Marion Poteet document the privations of war. Married in McDowell County in 1847, Poteet was working as a miller at the time of his conscription. Thirteen children were born to this union. For more materials from the Poteet-Dickson Letters, see the North Carolina Digital Collections. 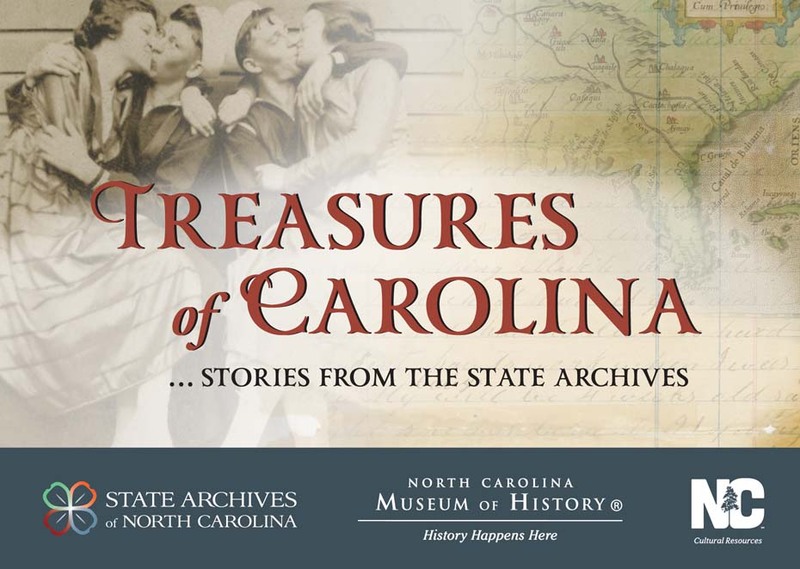 A selection of the state’s historic documents will be exhibited in Treasures of Carolina: Stories from the State Archives of North Carolina at the Museum of History, October 24, 2015–June 19, 2016. Documents from the Archives vault, unique letters, historic photographs, public records, and other media will illuminate the myriad of ways in which the holdings of the State Archives document the workings of our government, provide evidence of civil liberties, and preserve the history and culture of North Carolina. This exhibit is sponsored by the Friends of the Archives and runs through June 19, 2016. Additional funding was provided by the N.C. Bar Association Foundation, the Raleigh Times, and Wells Fargo. To learn more about the exhibit, please see: https://ncarchives.wordpress.com/tag/treasures-of-carolina/ and http://ncmuseumofhistory.org/See-Our-Exhibits/Current-Exhibits/Treasures. See the State Archives Facebook calendar or Dept. of Natural and Cultural Resources events calendar for more upcoming events. This entry was posted in Events, Special Collections and tagged exhibits, North Carolina Museum of History, Private Collections, Treasures of Carolina, United States Civil War on October 23, 2015 by Ashley. A pioneer in agricultural extension and education, Jane S. McKimmon helped to organize “tomato clubs” in North Carolina as early as 1912 where girls from 10 to 20 grew, sold, and canned tomatoes, earning money for themselves and their families. Tomato Club booklets were created as reports about the member’s activities and were hand-decorated by each girl. 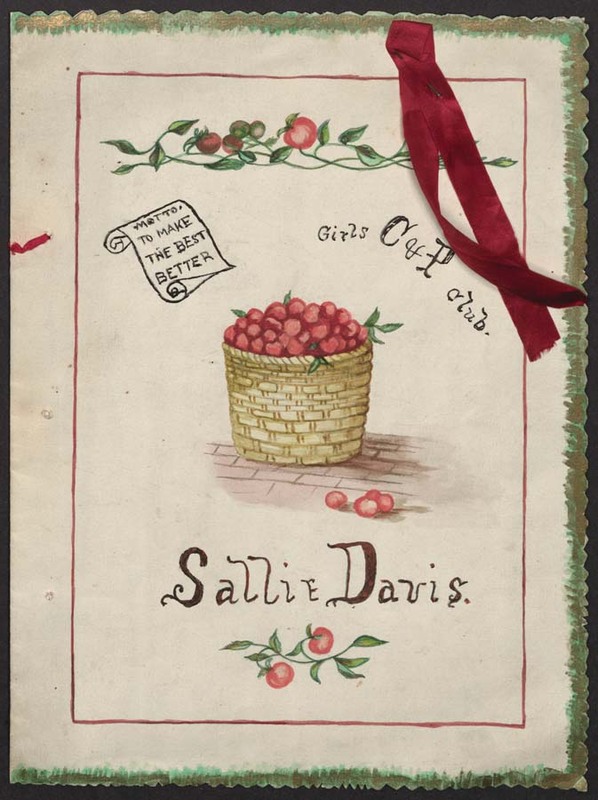 This booklet by Sallie Davis describes types of tomatoes, her planting strategies, and recipes for fresh tomatoes. Eventually, the clubs evolved to include many other types of produce, eggs, and poultry, and by 1914, thirty-two North Carolina counties had clubs. As home demonstration clubs, the tomato clubs were the basis for the modern-day extension service at North Carolina State University. To learn more about the exhibit, please see: https://ncarchives.wordpress.com/tag/treasures-of-carolina/ or http://ncmuseumofhistory.org/See-Our-Exhibits/Current-Exhibits/Treasures. This entry was posted in Events, Special Collections and tagged exhibits, North Carolina Museum of History, Private Collections, Treasures of Carolina on October 16, 2015 by Ashley.